as a menu item, so the user can see it but maybe not use it until they upgrade to a premium account or similar. 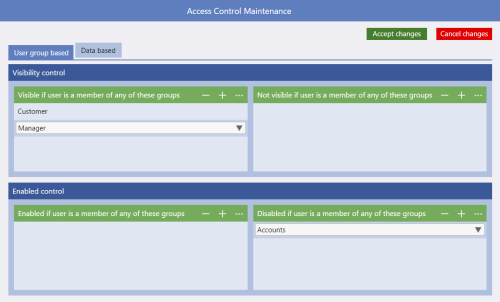 When you set up either user group access control or data based access control for for menu items, page components, properties in a template, etc the access control summary box will show either â€œControlled via User Groupsâ€� or â€œControlled via Dataâ€� to show that an access control has been set for this menu/page component/etc and which type it is. First you need to define the different user groups you want. This is done in App Settings. 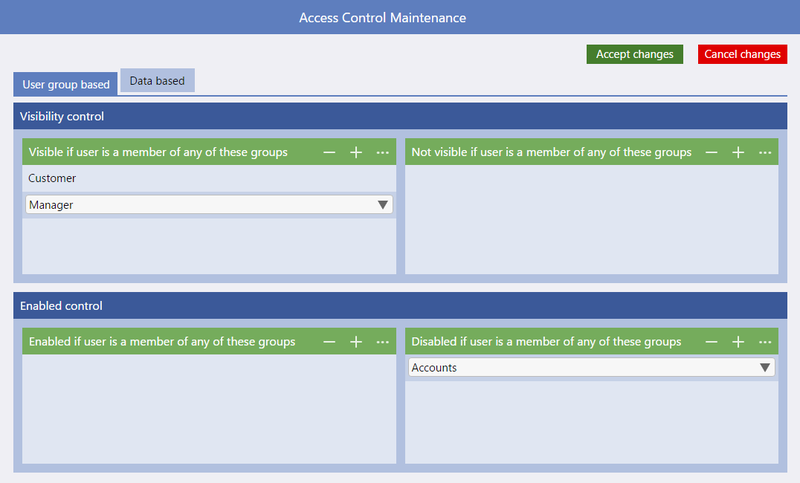 Once you have set up some Access Control user groups in App Settings, you will need to allocate users of your App to these user groups. This is done in your database in the AppUser record (AppUser Entity), you can add one or multiple access control user groups to the AppUser record (these should be exactly the same names as you entered in App Settings e.g. Customer, Manager, Salesteam, Accounts Department, etc as shown in the example on the right). The User Groups in your database should be mapped (in Data Mappings) on to the AppUserGroup property as defined in the Reserved Entities section. 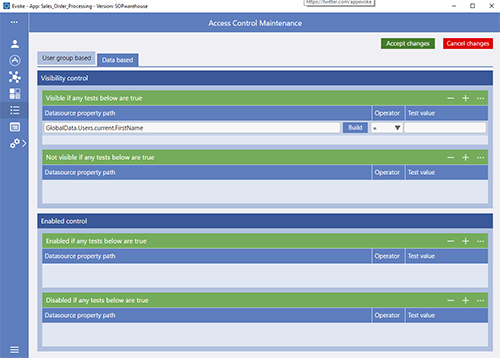 To add a Data Source Property Path, use the + symbol or ellipsis menu option to add a new entry and then use the DataSource Builder to select the specific property that you want to test. "$index" For example, an initial filter setting of: $index < 5 will result in only the first 5 items in the root datasource being contained within the refined datasource (index values are zero-based). The=,>, >=, < and <=o perators are supported for the $index property.